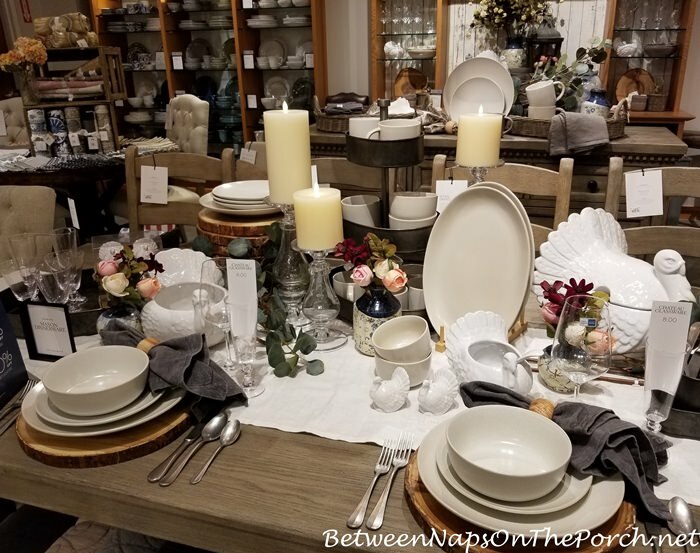 Welcome to the 518th Tablescape Thursday! I always have to be dragged kicking and screaming into fall. I know it’s not that way for a lot of folks who can’t wait for a bit of relief from the heat. When it comes to checking out the new dishware offerings for autumn, no dragging is needed. Ha! 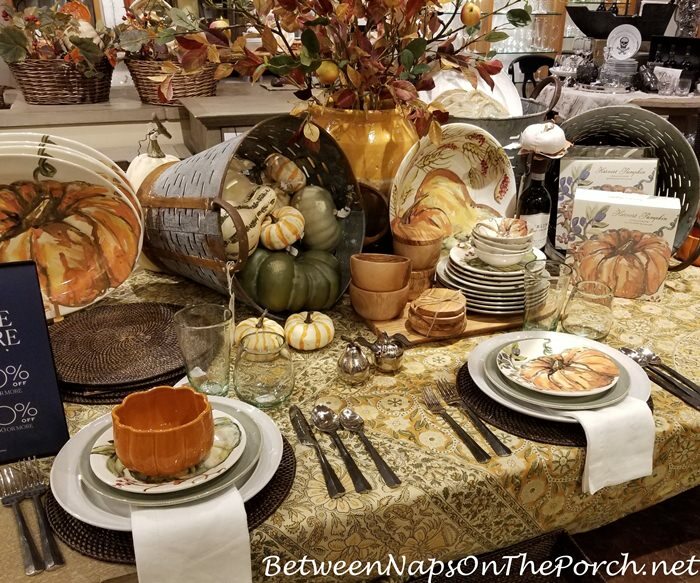 Yesterday I stopped into the Pottery Barn and Williams Sonoma near my home to see if they had their fall/autumn dinnerware out, and they did! It was almost enough to make me start thinking “fall.” Almost. Before we get into all the fall offerings, I have to share something I am seriously thinking of ordering today as soon as this post goes up. It’s these beautiful, white embossed chargers that are currently on sale, 20% off, plus another 20% off with the promo code FALL at checkout. I LOVE the design! I only have one set of white charger plates and I use them all the time during the summer months. I’m often asked about those in comments here at the blog. I would love a second set to use during spring and summer. Here’s how they look in a blue and white table setting. 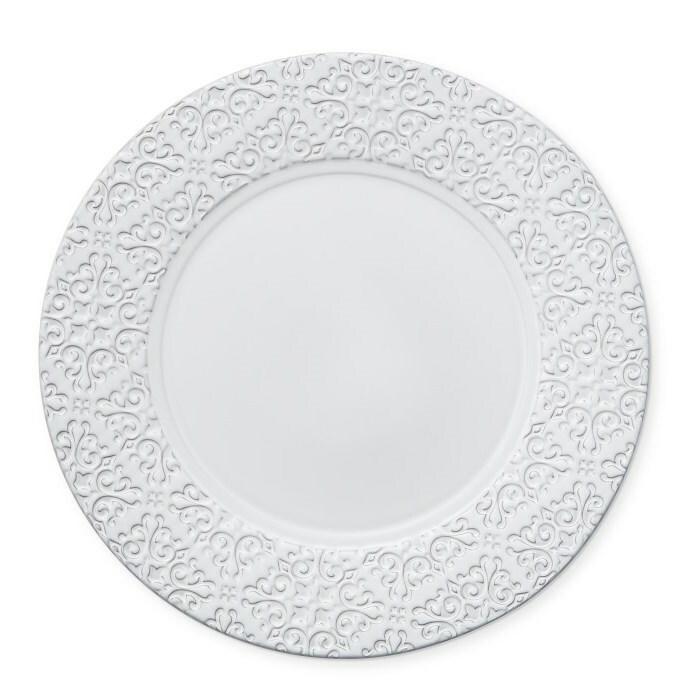 If you’ve been looking for a pretty set of white chargers that will go with all your dish patterns during the spring and summer months, you’ll find these on sale here: White Charger Plates. If you decide to get a set of these chargers, don’t forget to use the word “FALL” in the Promo box at check out to get free shipping and an additional 20% off. Update: I just ordered 8 of these while they are on sale. The promo code FALL did work and gave me another 20% off the sale price, plus free shipping. Super excited to get these! In addition to the white charger plates above, this was the next most-tempting item for me. I love these wildlife salad plates featuring colorful game birds. Just look at all that gorgeous fall color! I asked the sales associate if these would be going on sale anytime soon. She said no, because they would most likely sell out before that happened. I knew what she meant, I’ve had that happen before at PB with their most popular seasonal items. Update: It appears the code SAVEMORE works for getting these plates (and the other fall items below) on sale up to 30% off depending on how much you spend. I just love them! They say autumn to me! Here’s a photo showing all four designs in the set. You’ll find this set available here: Gamebird Salad Plates. Here’s another beautiful table I saw during my shopping trip. 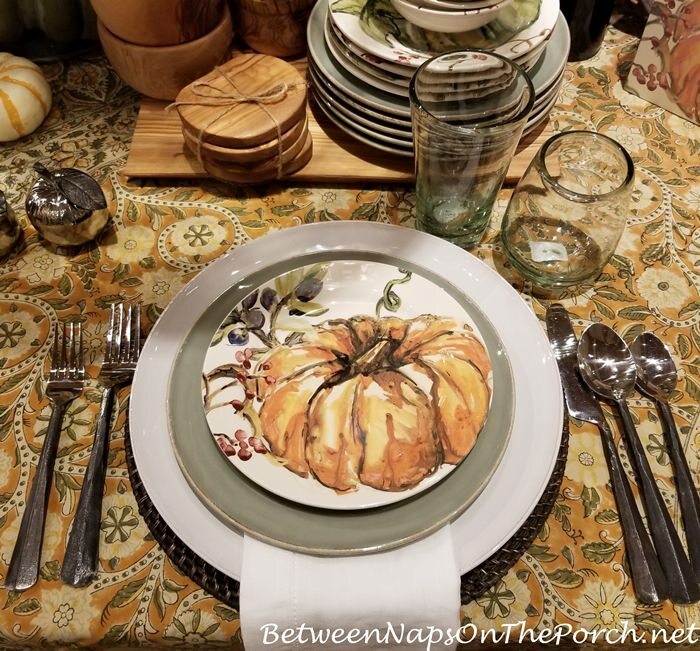 The highlight of this pretty autumn table were these cute pumpkin plates. See all four designs for these plates here: Pumpkin Plates. They set a stunning table, don’t they? Love how they look topped off with these pumpkin bowls available here: Pumpkin Bowls. If you’re looking for a great theme for an upcoming Halloween party, think Pirates! Only these pirates have become scary ghosts/skeleton pirates! 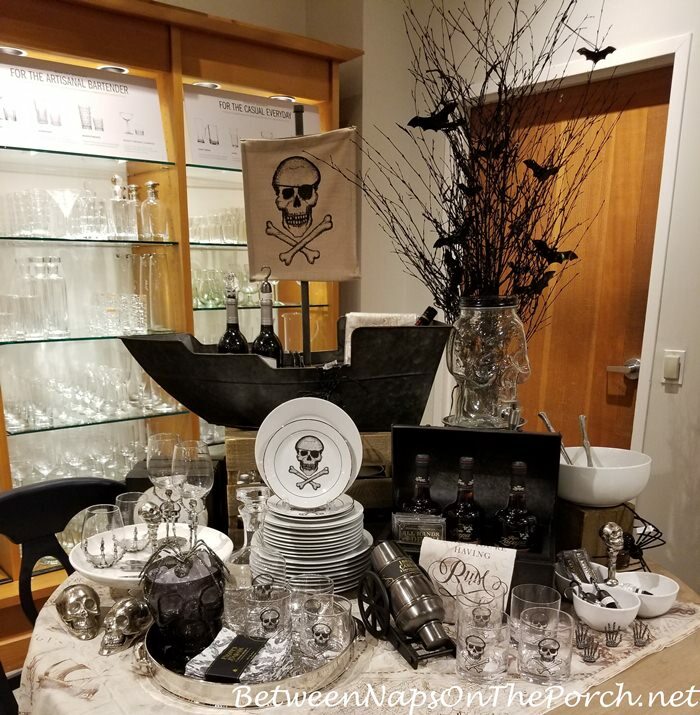 This large pirate ship that’s perfect for chilling the wine or drinks would make a great centerpiece for any Halloween party table. The pirate flag cracked me up! lol Love those little details! It’s available here: Pirate Ship Wine-Drink Cooler. Cute, cute pillow for Halloween! 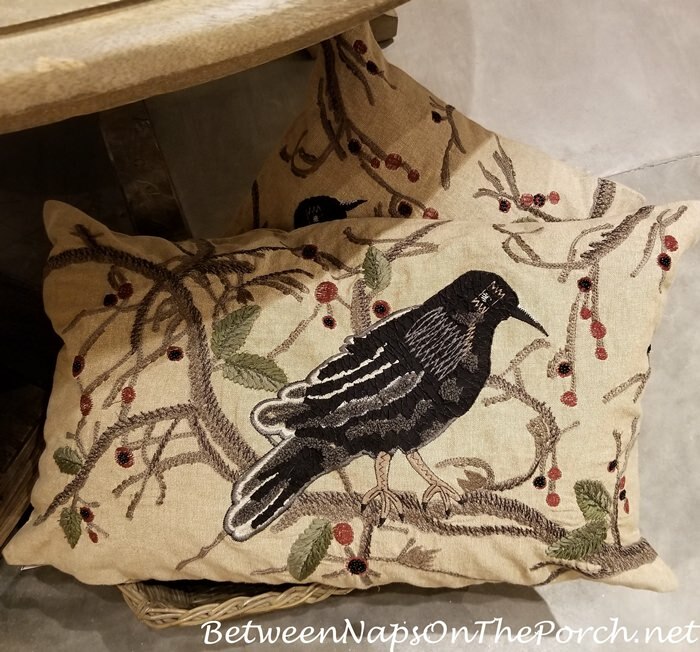 It’s available here: Crow Pillow. I need two of those for the black benches on my front porch. I loved these mummy plates! 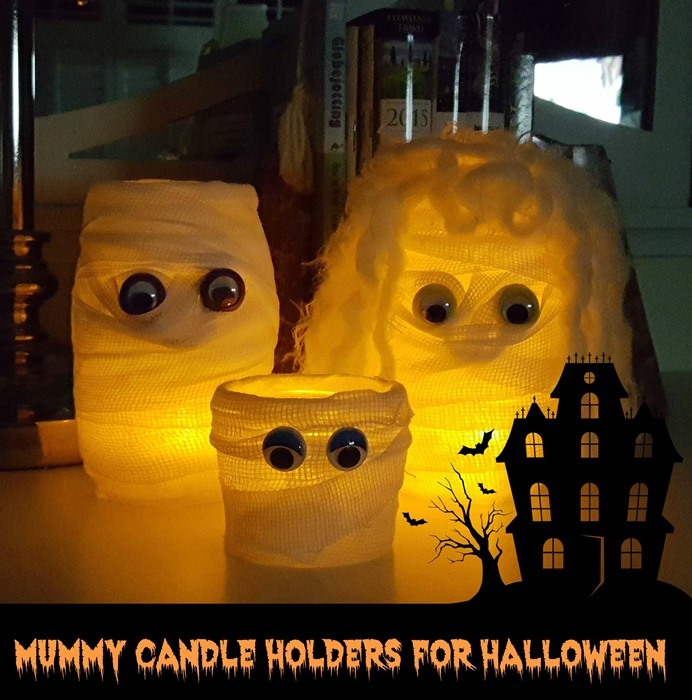 They reminded me of the DIY Mummy Candle Holders I made and shared in this post: Halloween Craft: Mummy Candle Holders. It will be time to bring those out before long! I think the mummy plates are large enough to work as salad plates. Arggg, they are so adorable! They are available here: Mummy Plates. I think they had the ghost mugs last year, I was tempted by those then. They are available here: Ghost Mugs. They’ve brought back their bark-edged chargers this year. I still prefer these that I found here: Bark Edged Chargers, plus they are a better price. My favorite thing on this table was this big ole fat turkey. He would make a great centerpiece for any fall or Thanksgiving table. He’s currently on sale here: Large Figural Turkey Tureen. I think that’s a great price for a piece this big. 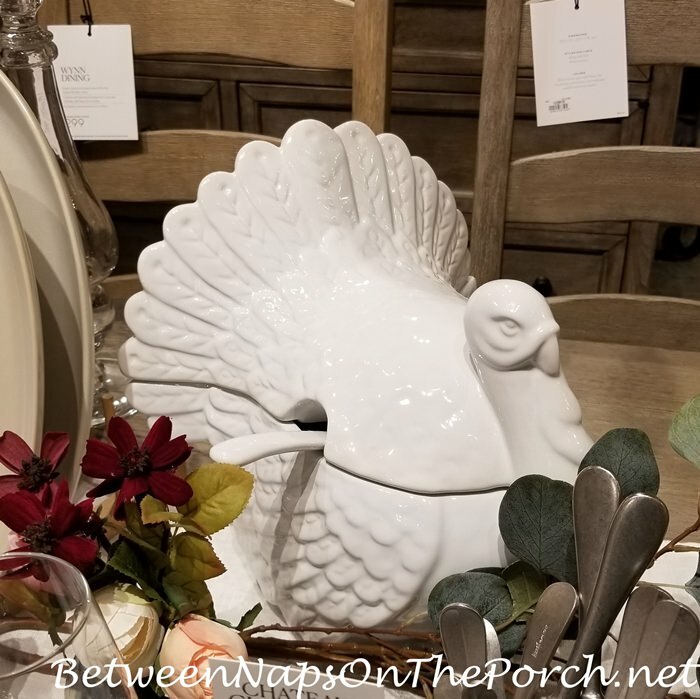 I paid more than double that for my large turkey and mine is purely decorative, not a tureen. 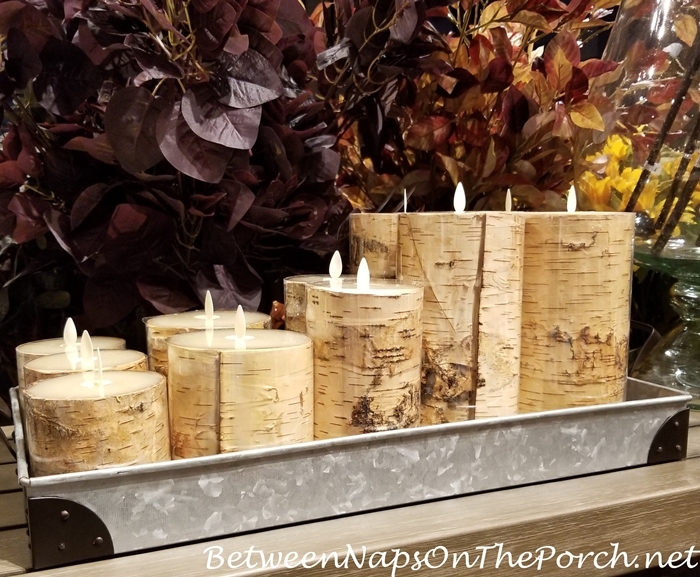 The last thing I saw as I was about to leave were these bark candles…so pretty for a fall display. They are available here: Bark Candles. 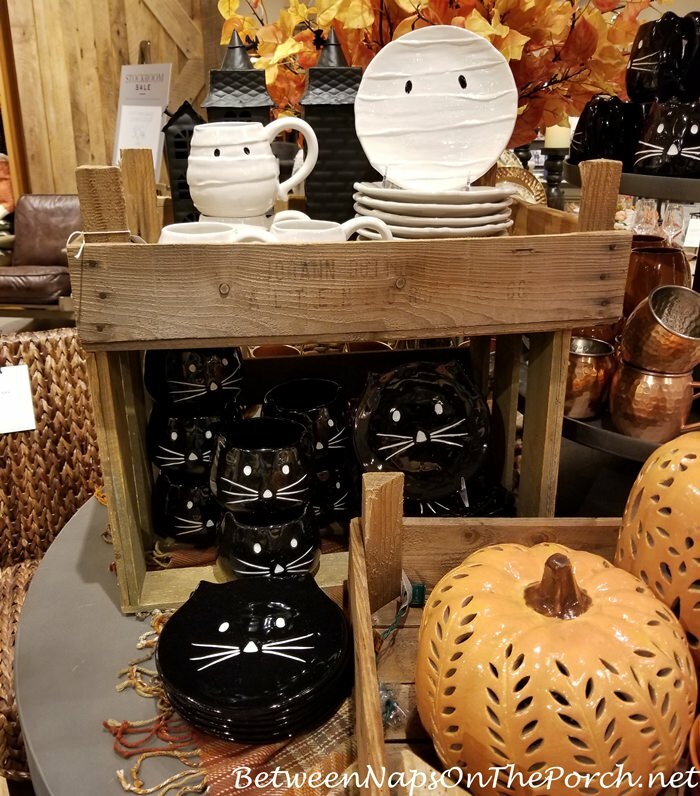 Reminder: Don’t forget to use the promo code SAVEMORE for additional discounts on all the fall dinnerware and fall decor. If ordering the white chargers shared at the beginning of this post, use the word FALL at check out for another 20% off the sale price. 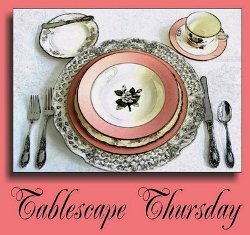 Looking forward to all the beautiful tables linked for today’s Tablescape Thursday! 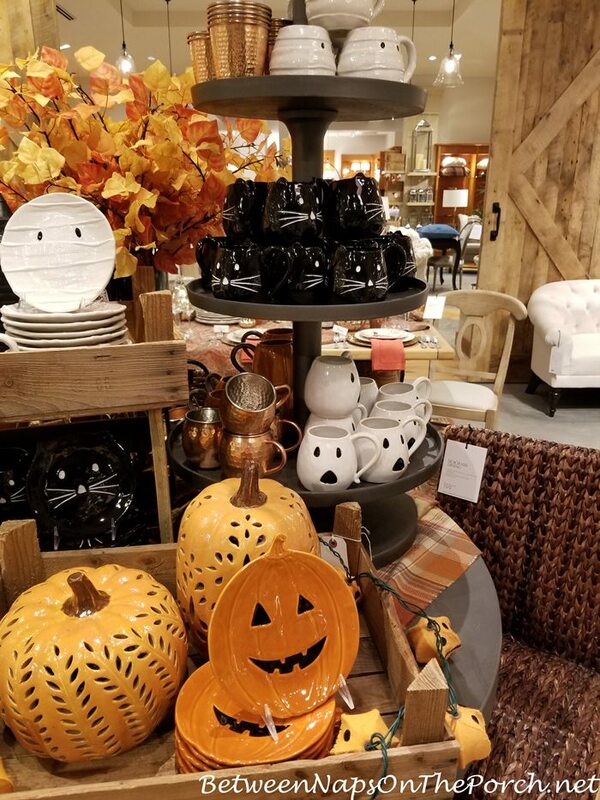 Yes, I agree seeing these lovely fall items is starting to peak my interest in getting out my fall items and pumpkin dishes when I get home. Notice I said “starting” to, haha. Today is our final day at the lake and I am enjoying every last minute of it. A major storm came through 2 days ago and cooled things down quite a bit, however it still is lovely here. Meant to mention yesterday that I love your new gem earrings and pearls are always my favorite. Happy (almost) Labor Day! Susan, those crow pillows will be perfect on your black benches. Everything here is so beautiful. 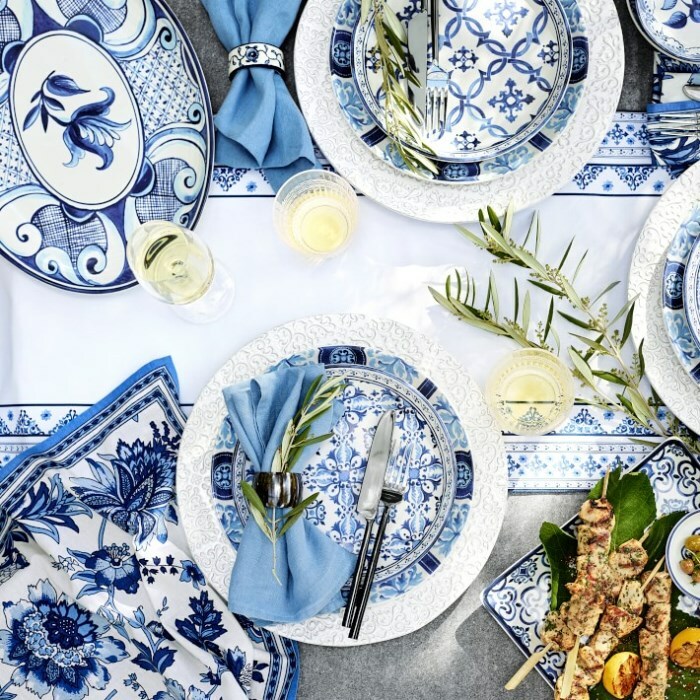 But that blue and white table setting is just mesmerizing. It’s pure eye candy. 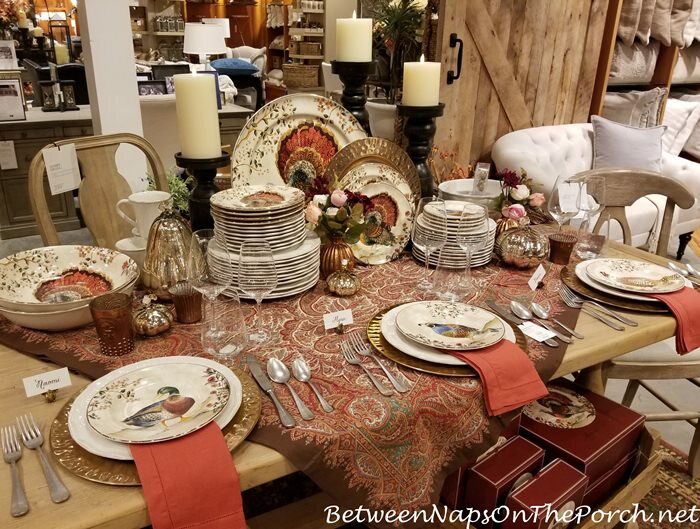 ~ Love the bird plates, particularly the duck, and those mummy mugs are too cute! 30% off game bird plates using the code word savemore. I would just want the pheasants but they come as a set. No dinner plates? 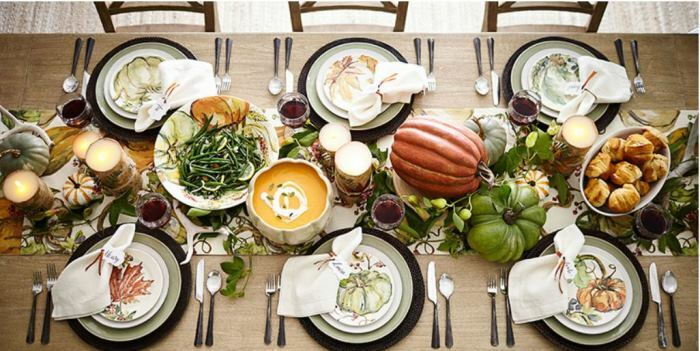 Have you check Home Stores for their fall dinner plates. 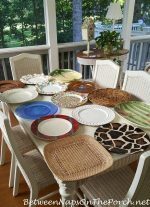 Bought at DOLLAR TREE yesterday gorgeous leaf plates of fall colors, bowls, salad plates, hand towels and a heavy towel for lying dishes out of rinse water even though we have dishwashers seemed like a good thing to have. 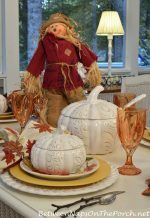 I will use these inexpensive plates Sept. 1 until Oct. 1 for the pumpkin plates and salad plates and bowls, cereal size for every day. Seemed to be good quality for a discount place. Went in for another reason and there at the door a whole table. Also had glasses and cup, oven glove and hand towels. Good deal I thought for everyday. Break one which I never have of their things just go get another one. I love Dollar Tree. Oh, yes…you’re right. I forgot I went into Williams Sonoma that night…that’s where the fall code works. Thanks, Linda! I know, I love Dollar Tree for their colorful wine glasses. I’ve found some really cute ones there! The game bird salad plates are awesome! When I go to Flo. soon, I will order them. 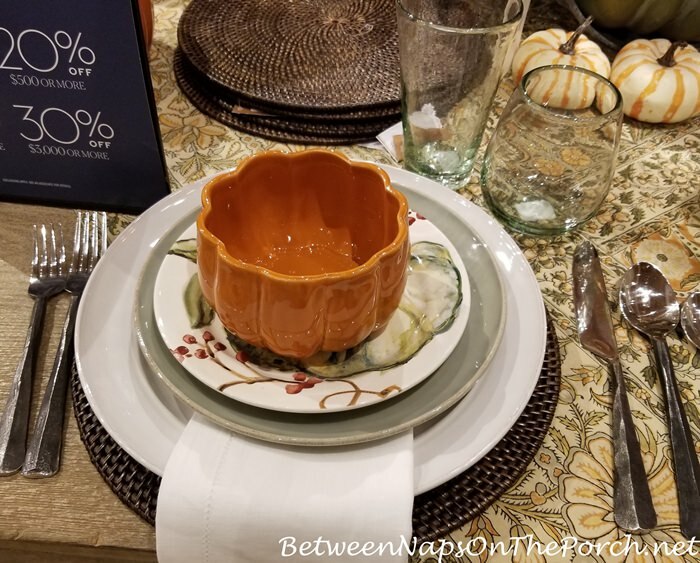 I too found a wonderful Fall dinnerware around here, the botanical type and I’m so excited, actually, I never had one for Tksgiving, except I used others that fit the event very well too. Thank you for the advice about the dishware for Fall and your white chargers are perfect and pretty. Thank you for yet again hosting another great party for us. Oh dear Susan, I’ve been avoiding the stores because there is just no where to store any more tableware at my house. Then you go and show that Pirate ship — not just great for Halloween, but when one lives in A town where our baseball team is the Pittsburgh Pirates, what’s a girl to do?!!! Yup, you need it Debbee. That would be hard to resist since you could it anytime. 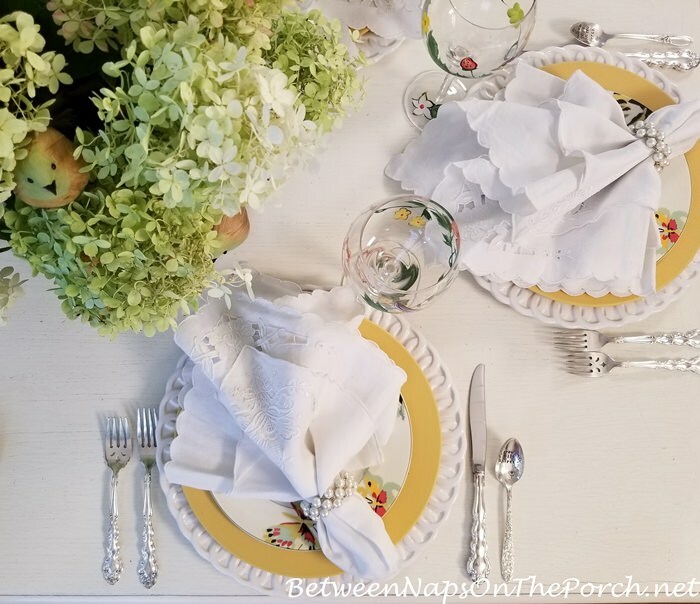 Your table settings is what drew me into your blog. Although, I enjoy seeing all that you do, I truly believe the table settings are my favorite. I have a beautiful Fitz and Floyd Pheasant Soup Toureen, that is my Thanksgiving center piece. 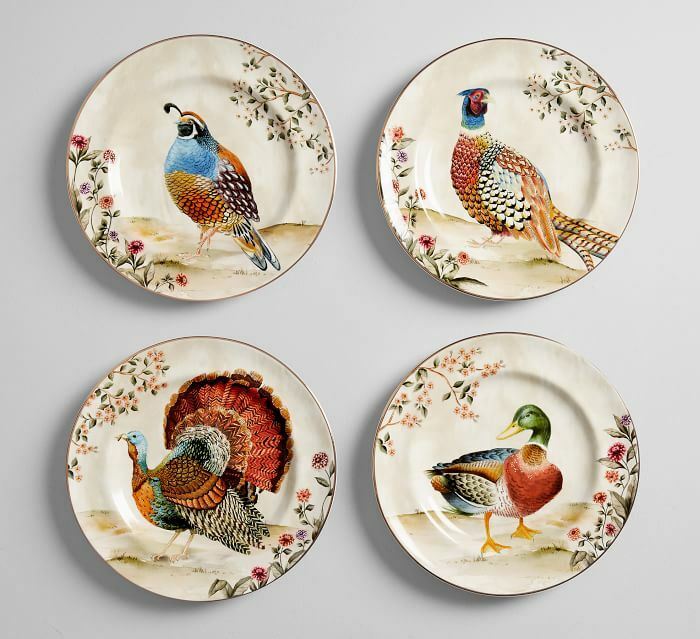 So I have been considering the Spode Bird that has the Pheasant for dinnerware at Thanksgiving. However, these that you are featuring today are very nice too. Hummmm! I have some thinking to do. Macy’s often puts it on sale in the fall, I think that’s when I bought mine so many years ago. That makes me want to buy another 6 place settings, currently I only have 6. Love the pirate ship; guess you could also fill it with those gold foil-covered chocolate coins for Halloween too. And the mummy plates are a riot. Thanks for the field trip. Love those chargers, and trying really hard to go with only what I have for this season (it’s so hard to resist buying sometimes, esp with stacked sales!). Of course, I have things I bought last year that are being used for the first time, so that’s the same as new, right?? 😉 I’m even trying to sell off a few things in the booths and upcoming community yard sale from prior years’ things. It at least gives me the feeling of purging (somewhat). I love to dream shop with you! I happy that I can resist chargers…..I dont want to have to wash another thing, and those embossed ones might be tricky. I’ve gotten lazy in my old age. But those pillows, and mummy dishware, well, maybe. Holy Catfish, Susan!! This post drove me crazy!! Everything you posted brought a smile and gasp from me!! I LOVE those mummy plates ( have ordered one for my dish rack for Halloween) and am sitting here fighting with myself about those white chargers. 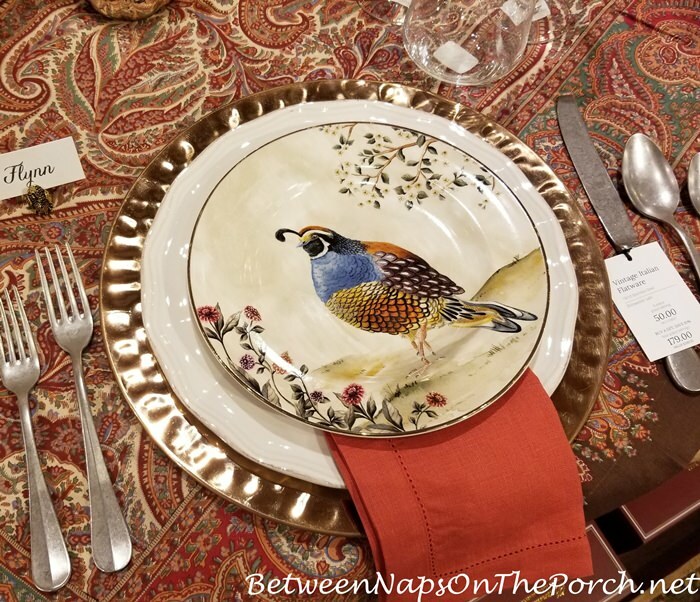 I keep thinking how pretty the table would be with those underneath my Lenox Butterfly Meadow plates. oooooo……what to do?!! Oh no, Susan! Why, oh why, did you write this post? You will be responsible for more griping from my husband. I’ve got the white chargers in my cart and I’m contemplating adding the turkey centerpiece. We recently downsized so I’m going in the wrong direction! Husband will be griping so loud you’ll probably hear him all the way in Georgia! This post was so much fun to look at – thanks for bringing the store displays to us! I love the timeless blue and white and how it will work effortlessly with pumpkins and orange hues for fall. I bought those birch pillar candles from PB with my reward points when they went on sale last year. I got them to use in January and February when I decorate with lots of greenery, snowy, white deer décor, etc. and recently thought of using them for Easter due to the natural color. But, your photo shows that they’re a nice element for fall too (I’m going to dress them up with my PB Arlington brass hurricanes!) and Victoria magazine had a gorgeous light blue and summer white beach table set with one, or something like it, in a lantern recently (you can see it on their July 12 facebook post). The birch candles really are a great investment with lots of year-round options! 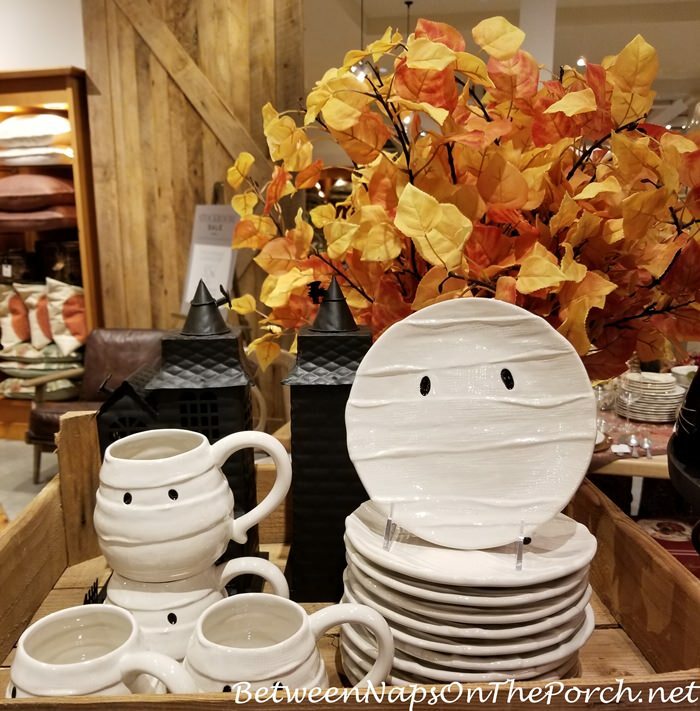 I’ve been eyeing the bird plates, pumpkin & ghost mugs! All so cute! I love the white charges you bought and I think the design kind of looks like snowflakes and you could use them in a snowy tablescape. Susan, I am drooling over EVERYTHING!!! OMG!!!! I am going to have rent a larger offsite storage unit. Those embossed white chargers are to die for, I bought them……sitting in the movie theatre with grandson, love shopping by phone LOL! That store is wonderful. I always love the silver hammered cookware and buy it. 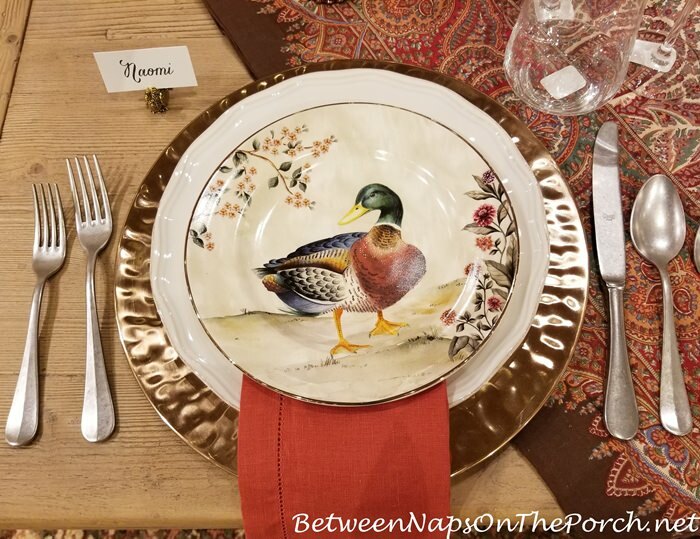 I do love the plates with the duck and pheasant on them, and they would match my turkey plates for Thanksgiving. I ordered the white chargers, they are on back order until early December. Yes, I ordered 8 of the embossed charger plates yesterday, the order confirmation said delivery would be between December 7 and 11, yikes. Thanks for that info, Beth. I’m glad they are getting them back in. Hopefully, they will get them back in sooner than that.